For Scott Reiman and Virginia Reiman, making a difference in their community isn’t a hobby, they make it their job. 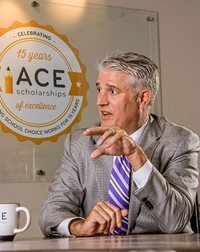 Since learning about ACE Scholarships almost a decade ago Scott and Virginia have been actively involved with the scholarship and school choice organization ever since. The Reimans support a wide variety of non-profit organizations across the state, but have made causes supporting education a priority in their efforts. “Virginia and I focus a great deal on education; it’s at the heart of all our philanthropy,” said Scott.